The Surface 2 is here - but how does it stack up on specs? The original Surface RT might not have set the world on fire, but Microsoft doesn't give up easily - and this week the Surface is back! Back! BACK! The cunningly named Surface 2 drops the RT suffix and beefs up the screen and other key specs. So how does it compare to its key rivals, Apple's iPad 4 and Asus's New Transformer Pad? Let's find out. Microsoft's Surface 2 is powered by a 1.7GHz quad-core Nvidia Tegra 4, as is the New Transformer Pad - but Asus's tablet has the 1.9GHz version, not the 1.7GHz version. The iPad runs a dual-core Apple A6X with quad-core graphics. The Surface 2 comes in a choice of 32GB and 64GB models, with 200GB of free SkyDrive cloud storage. The Transformer Pad will come in two variants, 32GB and 64GB (expandable via microSDXC and, via the dock, SDXC), while the iPad comes in four models: 16GB, 32GB, 64GB and 128GB. The Surface 2 has a 10.6-inch, full HD ClearType display running at 1,920 x 1,080, which is around 200ppi. Asus's New Transformer Pad has a 10.1-inch IGZO-TFT display running at 2,560 x 1,600 resolution delivering 299 pixels per inch. The iPad has a Retina display, a 9.7-inch IPS panel running at 2,048 x 1,536. That's 264ppi. 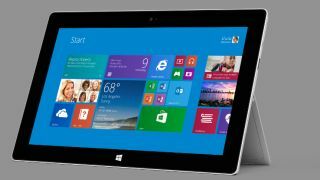 The Surface 2 has 802.11a/b/g/n Wi-Fi, Bluetooth 4.0, USB 3.0 and an HD video out port. The New Transformer Pad has 802.11a/b/g/n Wi-Fi and Bluetooth 3.0 together with a micro-HDMI output capable of driving a 4K TV, with additional ports including USB 3.0 in its dock. The dock also boosts battery life by four hours. The iPad has 802.11a/b/g/n Wi-Fi, Bluetooth 4.0, optional 3G/LTE and Apple's lightning connection for peripherals. The Surface 2 runs Windows 8.1 RT, which includes Office 2013 RT - and this time that means Outlook too. The New Transformer Pad runs Android 4.2. The iPad runs iOS 7. It lives! Windows RT has survived! The Surface 2 has a 3.5MP front facing camera and a 5MP, 1080p camera on the rear. The New Transformer Pad and the iPad both have 1.2MP cameras on the front and 5MP, 1080p cameras on the back. The Surface 2 will be £359 for the 32GB model. Asus hasn't confirmed pricing for the New Transformer Pad yet. Apple's iPad starts at £399 for the 16GB Wi-Fi model, rising to £739 for the 128GB Wi-Fi + Cellular model. The Surface 2 will ship on the 22nd of October. We're still waiting for Asus to commit to a launch date. The iPad 4 is already on sale, and we're expecting to see a newer model next month. The Surface 2 is a worthy entrant into this market, but still lacks a decent ecosystem of apps. It is, however, competitively priced though loses out in terms of screen specs to the iPad. The Transformer Pad is a powerful tablet that offers the alternative of Android, but we just don't know how much it will cost.